Comma delimited data can be downloaded directly from our data repository, along with a Matlab script that converts the important fields to arrays in a .mat file. Note: The Matlab script was updated Aug. 10, 2012, to process all the 2012 deployments. In 2011, we deployed two of these drifters and developed a preliminary page to display that data.2013 drifter data is also now available. This project is a collaboration between our school (the School of Fisheries and Ocean Sciences, UAF), the Geological Institute at UAF (Martin Truffer, Principal Investigator), and the Greenland Climate Research Center. 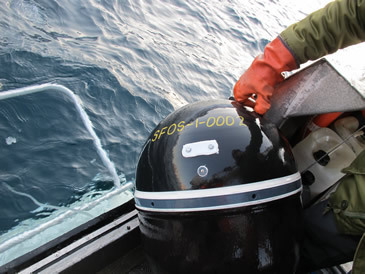 The drifters (manufactured by Pacific Gyre Inc.) are each equipped with Seabird MicroCAT temperature and salinity sensors at 3 depths - the surface, 7 m, and 15 m - to allow sampling of the upper-ocean stratification as well as circulation. A large drogue is below the deepest instrument, and the drifters have a high-accuracy GPS unit and "brain" in the surface sphere. Data is transmitted to us every 30 minutes via Iridium satellite. Instrument endurance is expected to be ~1 year, or longer if we recover them to replace the batteries. 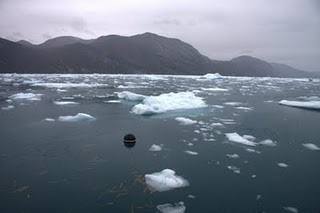 In 2012, the drifters were deployed by helicopter at the base of the glacier. The principal purpose of this project is to demonstrate the feasibility of instrumenting heavily ice-covered fjords to obtain real-time data of the upper ocean. 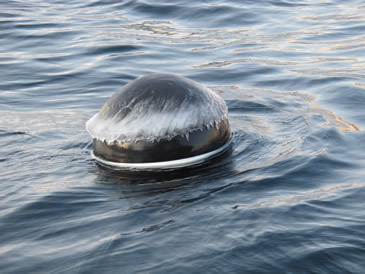 The project is more fully described in the Drifting Buoys project page. Above: A Google Map of Greenland with the drifter tracks included. Green push-pins indicate the drifters' deployment locations, and blue push-pins mark the current positions. Click on the icons for information about daily status and deployment objectives. copyright © 2010 art lab | Last modified: December 01 2017 22:28:03.